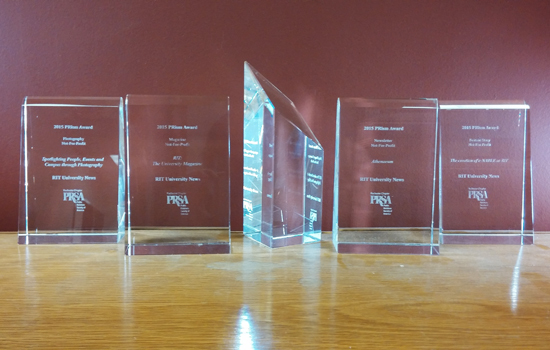 RIT University News Services took top honors in five categories at the 2015 PRism Awards, hosted by the Rochester chapter of the Public Relations Society of America. Rochester Institute of Technology won seven awards at the 2015 PRism Awards ceremony, including top awards in five categories. University News Services collected five PRism statuettes. RIT’s Production Services group received an Award of Excellence in the website category for its RIT University Arenas Website, and RIT’s Office of Diversity and Inclusion shared an Award of Excellence with University News for a collaboration on multicultural public relations. The awards, hosted by the Rochester chapter of the Public Relations Society of America, honor outstanding work in the field of public relations, among both corporate and not-for-profit sectors. Feature story: “The creation of e-NABLE at RIT,” a package written by University News Services Communications Specialist Scott Bureau. Magazine: The University Magazine, a 110,000-circulation publication aimed at RIT alumni. The magazine is published three times a year, under the direction of Associate Director Mindy Mozer. Newsletter: Athenaeum, a campus-wide publication produced by the UNS staff six times a year, under the direction of Associate Director and Managing Editor Vienna McGrain. The Athenaeum has been honored in this category every year since it was first published. Multicultural Public Relations: For “RIT’s University News Team Highlights Rochester City Scholars Program First Graduates” by Senior Communications Specialist Michelle Cometa. RIT was among six organizations recognized by PRSA for garnering the most first-place awards. The winners were chosen from among nearly 200 corporate and not-for-profit entries. Judging this competition were members of the Kansas City chapter of the Public Relations Society of America. More about the 2015 PRism Awards event winners and the local PRSA chapter can be found at the organization’s website, prsarochester.org. Historically underrepresented minority scholars are invited to apply for an innovative career development program this fall to experience life as an RIT faculty member. Research has revealed that people who learn English as a second language, including deaf and hard-of-hearing individuals, are underrepresented in STEM fields because of academic language abilities required to compete in those disciplines. A new project at NTID is helping to break down those obstacles specifically for deaf and hard-of-hearing people. RIT is inviting scholars from across the globe for a workshop this summer to foster innovative research in science, technology, engineering and math (STEM) education with a focus on developing junior and emerging researchers.